BBQ season is upon us. It is time for steak! And with that requires a decent set of steak knives (funny video link). These fine cutting cutlery from Messermeister Avanta are made from X50CrMoV15 German high carbon stainless steel and pakkawood handles. 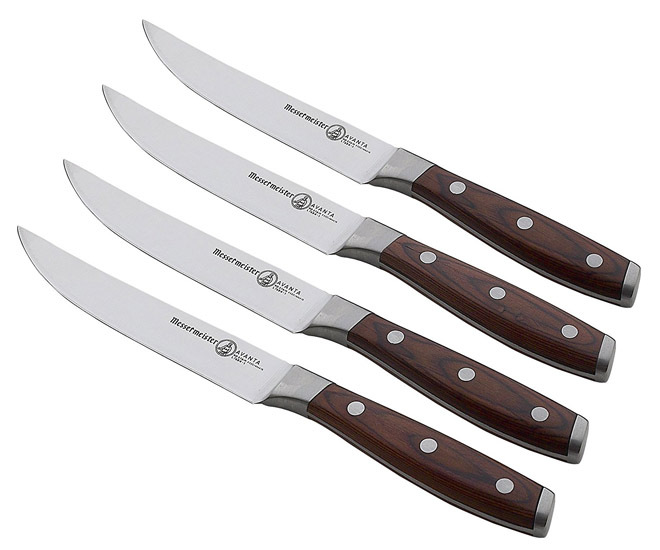 These are tough slicing and carving knives with a 5″ fine edge and an upswept boning tip. The fully exposed tang proves that it’s a single piece of steel. And no, I wouldn’t put these in the dishwasher, show them some love please. They come with a “The Knife for Life” guarantee that provides a lifetime warranty against material and manufacturing defects.